Social business represents a significant transformational opportunity for organizations. Many companies, after initial forays into external social media, are now realizing the value of applying social approaches, internally as well as externally. Social business can create valued customer experiences, increase workforce productivity and effectiveness and accelerate innovation. But many companies still wrestle with the organizational and cultural challenges posed by these new ways of work. 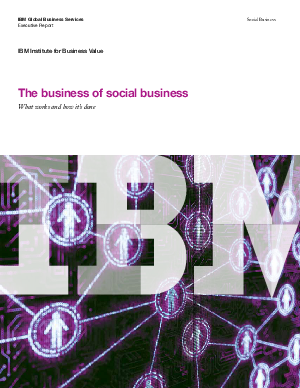 A new IBM Institute for Business Value study, based on responses from more than 1,100 individuals and interviews with more than two dozen executives from leading organizations, reveals how organizations can use social approaches to create meaningful business value.